Self catering accommodation at the The Quality Hotel & Leisure Centre, Youghal, 4 bedroom holiday homes brings the added benefits of being alongside the Hotels excellent Leisure Centre, bar, restaurants and beachside site. Each of these holiday homes are equipped with a fully fitted kitchen, which includes washing machine/dryer, cooker, microwave, and dishwasher. Each has 4 bedrooms, a double room ensuite, 1 twin room & 1 single box room with a separate bathroom. The sitting room comes completely furnished to the highest standard with a 2 piece suite and TV unit. The miles of sandy beach are just a few paces away along the lane, but there are other entertainments too. As residents you have free access to enjoy the Club Vitae gym, extensive 20m pool with sea views, kiddies pool, steam room, sauna, Jacuzzi, floodlit sports pitches, fitness studio and our 4 Treatment rooms at La Spa Vitae which includes the Balneo Therapy Suite. On Site we also have a Children Games Room, Movie Room and the Dolphin Playcentre and Club for the younger guests with outdoor beachside playground. After all that, you can enjoy The Coast Bar or Lannigans Restaurant. The Coast Bar is modern and contemporary in design and is an atmospheric spot for a relaxing drink for all the family. An Extensive Bar Food Menu is served from 12.30pm until 9pm each day along with our very popular Carvery Lunch which is served on a Sunday. Entertainment is provided every Friday & Saturday Night, and on many nights during July & August, Midterm Breaks & Bank Holiday Weekends. With sun-drenched views of the Atlantic Ocean and our Terrace in front of the bar you will be spoilt for Choice. In Lannigans Restaurant, the food style takes its influences finternational themes of dishes around the world. Our signature dishes such as our sharing and combination platters, along with our enchiladas will have you spoilt for choice with some 47 dishes to choose. The atmosphere is casual, friendly and unpretentious. With Stunning Views of the Atlantic Ocean there is something for everyone, you will indeed find yourself wanting to return time and again, in fact with the Coast Bar underneath you don’t have to leave the building for a terrific night out. Youghal is one of Irelands finest coastal resorts and is a colorful seaside town, which offers excellent holiday, leisure and shopping facilities. It is rightly regarded as one of Ireland’s most popular tourism resorts. This vibrant town is the Beach Centre of East Cork. 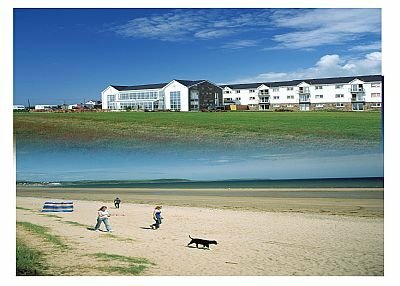 Quality Hotel & Leisure Centre and Apartments are located 2 miles from the centre of Youghal and enjoys a beachfront location on the beautiful sandy beach of Red Barn. These Holiday Homes are located in the heart of The Irish Riviera, on the coastline of East County Cork alongside Red Barn Beach in Youghal. It is approximately a 30-minute drive from Cork City, Ireland’s second largest city. It is strategically located on the primary tourist route from Rosslare and Waterford. It is effectively the ‘gateway’ for the UK and Continental tourists arriving at Rosslare for the Cork/Kerry region. All guest have free & full access to fabulous leisure centre facilities onsite of the attached hotel, and of course the miles of sandy beach are just a few steps away across the lawned garden.